Healthcare 3D printing industry is set to develop from being a niche domain to a viable alternative for the traditional processes that have been reigning the medical space so far. Healthcare fraternity is one such business space where the impact of innovations and technological breakthroughs has always been transformational, considering the continuous improvement in surgical processes, drug development, and overall patient specific well-being. 3D printing technology is the latest disruptive trend that is bringing a new dimension to the surgical practices, subsequently fueling healthcare 3D printing industry demand. Synonymous with ‘additive manufacturing’, this brainchild invented by Chuck Hull has traversed a long way from its roots in the past three decades. Today, 3D printers can not only handle a variety of materials ranging from human cartilage to titanium, but also are capable of manufacturing fully functional components including batteries, complex mechanisms, LEDs, and transistors. Global spending on 3D printing technology is forecast to reach approx. USD 29 billion by 2020. This speculation is undoubtedly shedding a positive light on healthcare 3D printing market commercialization. Market analysts claim the diversified application spectrum of healthcare 3D printing industry to be predominantly segmented into three categories. The first one includes mainstream or close to mainstream devices (like hearing aids and dental devices). The second covers those domains where 3D printing, despite being widely deployed, still cannot be considered mainstream (such as prosthesis and medical devices manufacturing). The last category on this list is that of bioprinting i.e. printing with cells, that is relatively a new field. The incorporation of 3D printing in these domains is still at a nascent stage of development, however, considering the rigorous ongoing research activities that are being undertaken currently, this sector is proclaimed to soon enter the mainstream application landscape of healthcare 3D printing industry. The deployment of 3D printing in healthcare industry enables the personalization and customization of medical products, and is endowed with the benefits of cost effectiveness, democratization of design, enhanced technological collaborations, and increased productivity. While digging into older records, it has been observed that the foremost industrial application of 3D printing was in the fields of prototyping and tooling. The potential contribution of healthcare 3D printing market in dentistry is therefore not of much surprise. Today, with the combined influence of CAD (computer assisted design), oral scanning, and 3D printing, dental labs are efficiently producing bridges, crowns, plaster models, and a variety of orthodontic appliances such as aligners, surgical guides, etc. In fact, statistics depict that the emergence of digitization and 3D printing has profoundly elevated the success rate of dental implantology, with the use of these 3D printed custom surgical guides. In addition to this, healthcare 3D printing industry has also allowed a renovation in the workflow model of the dental labs, prominently increasing the production capacity. Numerous healthcare 3D printing industry giants are launching products that are widely deployed in orthodontic labs. The domain is being penetrated by a couple of small scale companies like Zenith 3D Printing System and Valplast, in addition to leading healthcare 3D printing industry players like Stratasys and EnvisionTEC. Prosthesis is another sensitive segment in medical fraternity where healthcare 3D printing market is experiencing a strong foothold. 3D printed prosthesis is quite an exemplary innovation with regard to technological advancements that are influencing the business outlook. Not only are they fully customized and much more comfortable than the conventional prosthetic devices, but are comparatively cheaper than their traditional alternatives. In this regard, it is important to note that 3D printed limbs are commonly used in child prosthesis, pertaining to the fact that children outgrow the prosthesis fast. Speaking along similar lines, the requirement of manufacturing inexpensive 3D printed prosthesis for the victims of land mines across the Africa and APAC belts has led to the formation of e-NABLE. The Enable Community Foundation is a passionate group of individuals from all across the world who create free 3D printed arms for those in need of upper limb assistive devices and that too, at a very cheaper cost. Such progressive initiatives in the healthcare 3D printing industry landscape are likely to revolutionize the overall medical space. In the year 2015, a five-month-old girl of Karnataka detected with craniosynostosis (fused skull bones) underwent an endoscopic surgery at the Bengaluru-based Sakra World Hospital. Post the operation the girl was employed with a helmet to exert pressure on the indicated parts of the skull. Ordinarily, these helmets would have cost near about 1.5 to 2 lakhs in the U.S., and once ordered, they would have reached India in around 2 to 3 weeks. In this case however, the subject was equipped with the helmet within just a couple of hours, and that too at a very reasonable cost of just INR 20000. The star behind this breakthrough was a startup in the healthcare 3D printing industry, Osteo3D. Innovations in prosthetic design and recent ubiquity in 3D printers are allowing millions of people around the world to reap the benefits of advanced manufacturing technology. Taking into consideration the technological advancements such as integrated sensors and propulsion system, prosthesis, in near future is expected to cover a significant portion of the healthcare 3D printing industry. • Kentucky-based software firm, Advanced Solutions has recently developed a cognitive 3D human tissue printer called BioAssemblyBot that is proclaimed to operate on a six-axis robotic arm. It is profoundly a breakthrough in the healthcare 3D printing industry subject to the fact it is claimed to be the first of its kind across the world. These second-generation 3D printers are focused on producing biomedical printers that are intended to revolutionize the healthcare space. • Harvard University researchers have already made world’s first entirely 3D printed human organ on a chip with integrated sensing. Built on a fully automated digital manufacturing platform, this 3D printed human heart on a chip is reported to be easily fabricated and customized, thereby making data collection much easier. Healthcare 3D printing industry is characterized by a strong regulatory framework enforced by the Food and Drug Administration. The FDA has apparently issued guidelines for 3D printing applications across various healthcare domains including biologics, drugs, and medical devices. The organization is also working with leading companies to clearly understand additive manufacturing technology for further improvement in the guidelines. • Drugs are regulated by FDA’s Center for Drug Evaluation and Research. A slight dearth of skilled technical expertise, high initial investment, non-uniform reimbursement policies, and copyright and patent infringement issues are some of the challenges that healthcare 3D printing market players are dealing with. However, the contribution of 3D printing in healthcare industry remains colossal. 3D printing is predominantly deployed across the orthodontic, prosthesis, implants, and medical instruments manufacturing sectors. Recently, it is also making inroads across the pharmaceutical division, thereby creating a new growth avenue for healthcare 3D printing industry. Here’s an evidence attesting to the aforementioned acclamation – a renowned specialty drug delivery platform, Aprecia Pharmaceutical Company, has got an approval from the U.S. Food and Drug Administration for its 3D printed tablet Spritam, in March 2016. Reportedly, these ZipDose Technology based 3D printed tablets are used for epilepsy and are the world’s first 3D printed tablets to win an FDA approval. All in all, the contribution of 3D printing in healthcare industry is universally acclaimed and it is expected to bring forth revolutionary changes in the medical space. Hearing aids are the first manufacturing devices that were designed completely using 3D printing, then followed by dentistry, while research is still underway in applications like prosthesis, implants, models of virtual surgical planning, medical devices, and drug development. A notable contribution of 3D printing in healthcare market is the proliferation of this technology in personalized medicine. Though still at a burgeoning stage, 3D printing is sure to bring about ground-breaking breakthroughs in the medical space in the coming years. 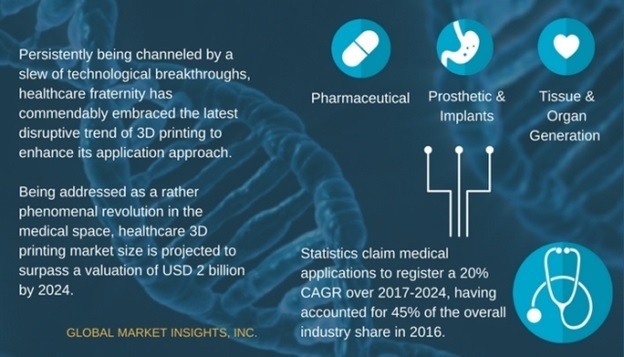 Bearing a testimony to the aforementioned speculation is the estimate claimed by Global Market Insights, Inc. As per this research report, healthcare 3D printing industry, by the end of 2024 will surpass a valuation of USD 2.2 billion, with a massive CAGR of 20% over 2017-2024.